Each month Rainier Title sends us the previous month’s appreciation rates. In September Crown Hill real estate appreciated 15% and West Queen Anne/Green Lake/Phinney/Wallingford at 14%. Following these were Magnolia and Lake City/Northgate by 12%. 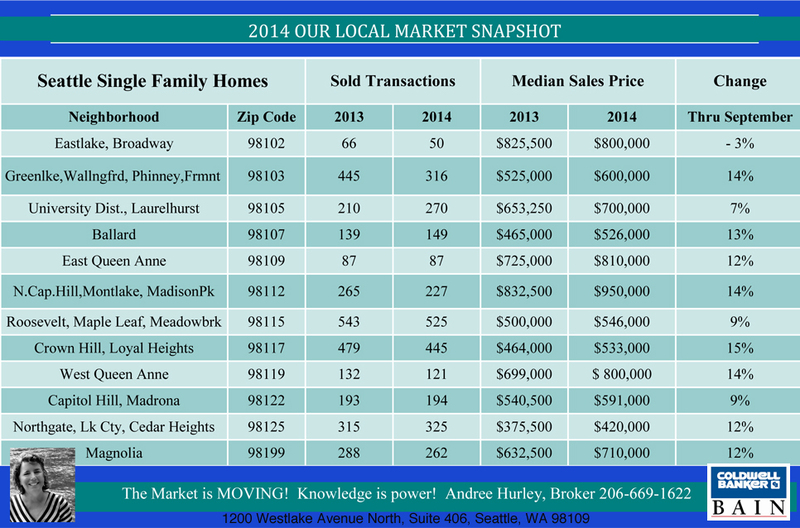 These numbers substantiate the demand we are seeing for homes in and around Seattle. The competition is still high for new listings with multiple offers and escalations. If you are preparing to put an offer on a home, be sure to give yourself enough room to escalate. Be pre-approved or even underwritten for a to-be-determined address and customize a nice letter to the seller (some want to see these, others don’t). Less contingencies also make your offer stronger. For example, if you can get a pre-inspection and then waive the inspection contingency your offer will be more likely to float to the top. However, this can get expensive if you are making many offers and some sellers don’t allow this. Another contingency is the financing contingency. Again, you do want to be pre-approved. There is a little room built in to change lenders however this should be used carefully. The neighborhood review is another contingency – try to satisfy your needs in advance for good schools and a secure neighborhood. This falls under the auspices of the buyer as brokers are not allowed to specify what neighborhood might be safe. The city of Seattle has a great crime statistics website. A substantial down payment also sends a strong message, especially combined with solid financing. The seller wants to know you are serious. A steady job counts for a lot – if you work for yourself you may be required to show one to two months of tax returns. One may think that an all cash offer would trump financing, but this hasn’t always proven to be the case, especially when the cash offer is lower than the final escalator. The escalator amount can also matter; some escalate in numbers such as $5000 at a time, others go up a percentage. The percentage can put the offer at a higher mark. From the sellers side, your home needs to be priced appropriately; homes that are obviously overpriced are staying on the market longer than one or two weeks and can have the impression of having something wrong with them. Homes that are priced correctly are seeing from two to as many as forty offers. The home should have great curb appeal and professional photography – most buyers shop online and those images are what brings them to your doorstep. In summary, the appreciation rates show continued demand for homes in the Seattle area. If you are in the market as a buyer be sure to have your ducks in a row ( 🙂 ) before you make an offer (I can help you with this!). If you are the seller, prepare your home carefully, price correctly and have great marketing.